If Rowan Atkinson were to resurrect one of his past projects, the logical choice would have been Mr. Bean, or possibly Blackadder. Hell, even Rat Race could have used a reboot, so long as they could get Whoopi Goldberg involved. But Johnny English? Who asked for this? Nevertheless, Atkinson's spy spoof is back for a third instalment. 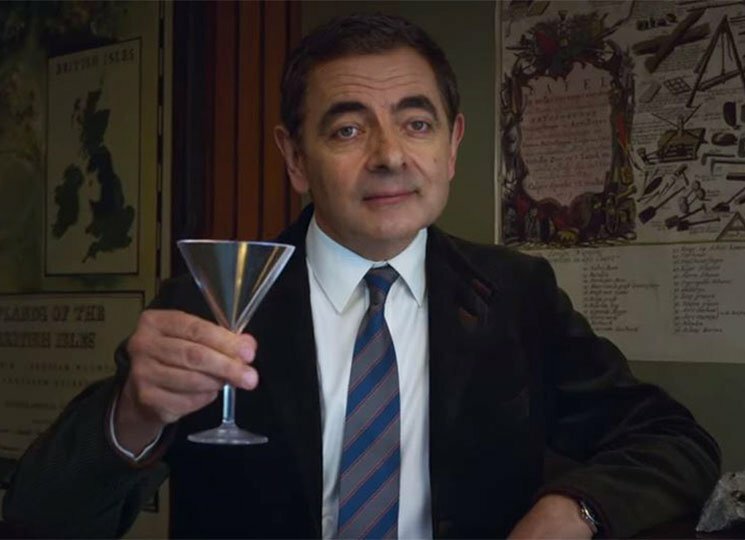 Johnny English Strikes Again, basically Austin Powers for the internet generation, is about an old-fashioned special agent who suddenly finds himself out of touch with the modern world. It's British Intelligence with a side of idiocy. The film opens with a cyber attack, as a hacker exposes the identity of every British undercover agent. The Prime Minister (Emma Thompson) must call in a retired spy who's not in the digital database — cue our hero Johnny English, who has been working as a geography teacher in a posh school. For some reason, he's been teaching the kids spy techniques, kind of like School of Rock with a whiff of reckless endangerment. The running joke is that Johnny English is a luddite, so while everyone else is making logical suggestions about hybrid cars and smartphones, our star is faffing around with booby traps and Aston Martins. Some of the jokes rely on painfully clumsy setups and punch lines. Case in point: Johnny's sidekick Bough (Ben Miller) suggests they fill up on gas, at which our hero scoffs and says that the car is very efficient. The ever-so-hilarious payoff is that the car runs out of fuel during the ensuing chase scene with seductive frenemy Ophelia (Olga Kurylenko). It's irony on the level that a young child could understand. It's a pleasant surprise, then, that Johnny English ultimately offers some pretty solid gags. One wacky scene finds English posing as a French waiter attempting to flambé prawns table-side, with wonderfully silly results. Funniest of all is an extended bit involving a virtual reality headset on a crowded street. These sketches all involve slapstick physical comedy, mild public embarrassment and almost no talking — which is to say, they're basically vintage Mr. Bean sketches with a spy theme. There's something decidedly old-school about this goofy, good-natured comedy, which has no grit or thematic heft but is good for a laugh. The film's vanilla sense of humour is almost as retro as its protagonist, but with a fast-paced runtime of less than 90 minutes, it's lively and likeable. It's enough to make you hope for a new Mr. Bean movie.